Slow boat to Odaiba! With karaoke! Ooooh, i can see Ken there in white! I miss him! Glad you all had fun! 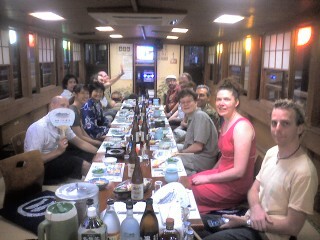 We had a great time, but Ash was very seasick and was not a well man that night. I was worried that we wouldn’t be able to go to Saipan but he felt well enough to travel. He was still ill a few days later so it may have been something he ate.